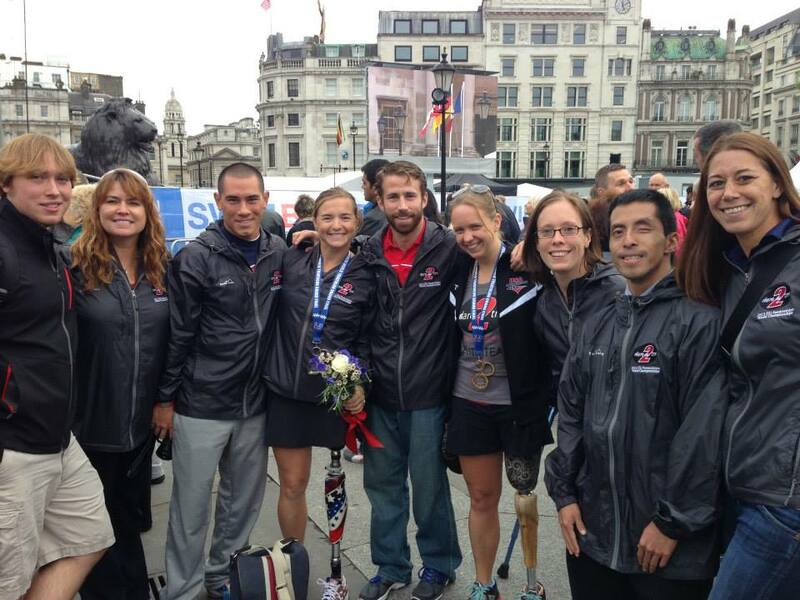 This year, I joined five other dare2tri Elite Team athletes in making the journey from Chicago to London. We arrived three days before the race, and spent those days attending meetings, doing light workouts, and catching up with Team USA friends. The dynamic at races like this is always a little strange—you are excited to be in another country and explore everything it has to offer, but at the same time, you know you’re there for business. Needless to say, my experience as a tourist in London was limited to Hyde Park, the inside of my hotel, and a welcome meal of shepherd’s pie. I went into race week feeling strong. I had trained hard all summer and had cut minutes off my overall sprint time. I knew where I stacked up against the other two Americans in my category, but there was one wildcard: a new girl from Denmark. While the TRI-2 category typically only contains above-knee amputees, this girl had two (what looked like fully functioning) legs. But she was classified as having a “severe leg impairment’ and would thus be competing in our category. I saw her a few times before the race and was a bit skeptical about the severity of her impairment. But I knew there was nothing I could do except trust that the system was fair and race my best race. Denmark aside, it was going to be a tight race between me and Melissa, my good friend and mentor from Chicago. Melissa had won gold at every World Championship for the last three years, and was favored to hang on to her title again this year. But I had a confidence going into this race that I didn’t have before, and was ready to make this my year. Based on our last race together, we were close to evenly matched, and I knew that the difference between gold and silver was going to come down to who had a better day. I was going to have to have a close-to-perfect race if I wanted a shot at gold. It was going to be hard, but it was absolutely possible. I woke up on race morning with the same adrenaline rush I always feel on race day. But a 4:30pm start time meant that I had a lot of hours before I could put the adrenaline to good use, giving me plenty of time to walk aimlessly around the hotel (no, front desk lady, I’m not looking for something…just walking) tinker with my bike (I usually do 110psi but maybe I should try 112…), and wonder what/when the hell I should eat (should I have my traditional oatmeal and coffee for breakfast, or two hours before the race? But that veggie quinoa salad at the petrol station looks delightful! Ah, the dilemma!*) . *In case you’re wondering, I ate the quinoa. Gas station food in London is seriously amazing. We headed down to the race venue in the middle of Hyde Park shortly after noon, taking our merry time to check in and set up transition. 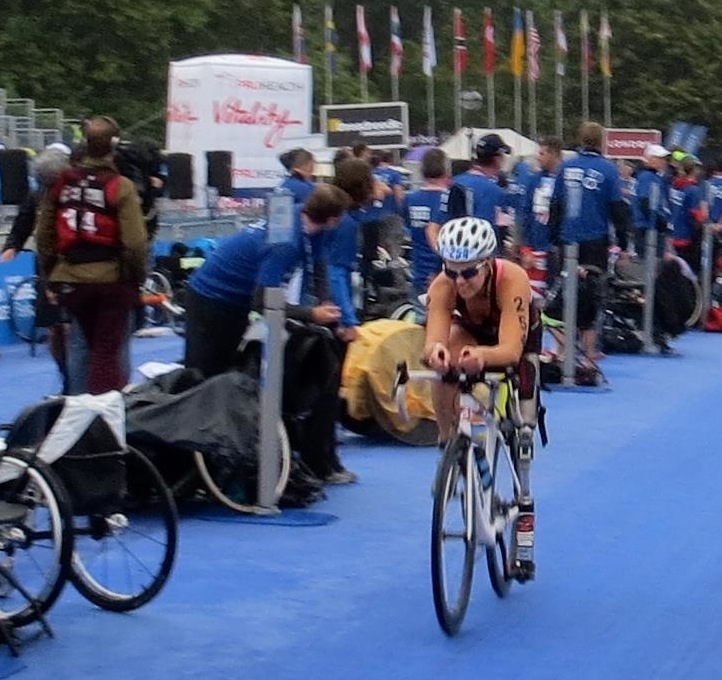 The Paratriathlon field was bigger than it’s ever been, and with a total of 220 athletes, they decided to split the field into two races. This meant that I got to watch many of my friends for parts of their race, serving as a nice distraction from my own nerves. Before I knew it, we were being called down to the water and lining up to start. Sitting next to my competitors on the edge of the Serpentine, we exchanged head nods and wished each other luck. I closed my eyes, ready to race my heart out. And then, we were off. The swim was okay. It is still my weakest by far, but I have improved my time a lot in the last year. I got out of the water a couple minutes behind Melissa (which I expected) but I was happy to hop into transition and see the other girls’ crutches still there, putting me in second place. The bike portion was a 6-loop course of a little over 2 miles per loop. I thought that riding in a circle 6 times (not to mention counting that high) would be awful, but it was actually kind of nice to get to know each turn of the course early on, and to get a little crowd support on each lap. It had rained all day, so there were parts of the course that were a bit slick. I had heard of a couple crashes that happened in the first Para race, so I was riding a little more conservatively than usual. But I was feeling fast and determined to make up some time on what is typically my strongest of the three legs. On my second lap of the bike, I got passed by Denmark. Ordinarily, I would have viewed this as a huge blow, but I decided not to let it get to me. As I watched the ease of her pedal stroke as she got farther away, I knew that there was a good chance that she would be classed out of our category. So I just kept powering through, immediately forgetting about her and setting my sights on being the first American. 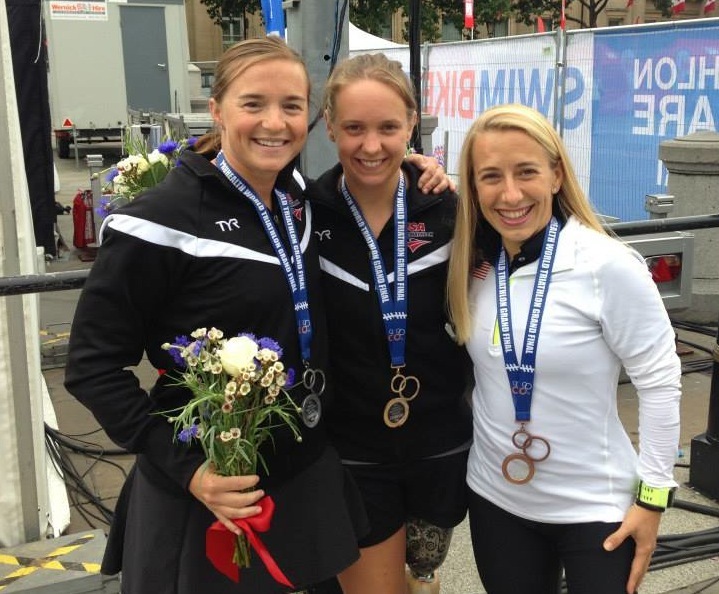 Sure enough, after the race was over, USA filed an appeal protesting Denmark’s classification. The appeal was approved, thereby disqualifying her. With each lap, I rode past transition where my handler, Dan, was calling out my times and letting me know how far I was from my competitors. I started off a little over three minutes behind the leader, but was making up ground with each lap. Halfway through, Dan shouted my splits, and I realized I had made up over a minute on the previous lap. I knew something wasn’t right. My bike felt good, but not that good. After the race, I found out that Melissa had gotten a flat tire, and had to stop at the wheel pit to change out her wheel. 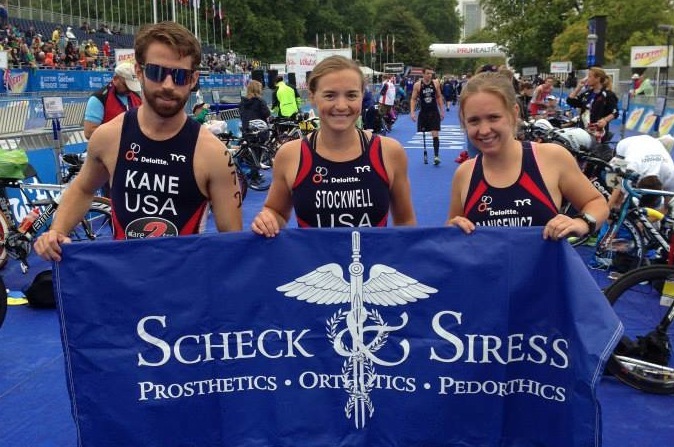 Every triathlete’s worst nightmare, happening during the most important race of the year. Talk about bad luck. Of course, I had no idea any of this was going on at the time. I just kept on pedaling, shaving time on each lap until the end, when the difference was down to a minute. I had a feeling that the race was going to come down to the run, and I knew that if it did get to that point, I would be able to find a speed that I didn’t know I had. I stepped across that timing mat determined to have the best run of my life. It usually it takes me a mile or so for my legs to warm up off the bike, but that day, they were back immediately. I wasn’t wearing a watch and had no concept of how fast I was going, but right off the bat I could feel that I was having a great run. I kept Melissa in my sight as we approached a turnaround, where I also saw that my other competitor, Sarah, was not far behind. I was in it. Around what had to have been the 1.5-mile mark, I thought I saw the gap between Melissa and I begin to close. At first I thought I was imagining it, but before I knew it I was right at her heels. A million thoughts were racing through my head: Should I hold back and make a move later on? If I sprint now, will I crash and burn later? But one thought spoke louder than the rest: go for it. I surged ahead. We held even for a few seconds, each of us looking straight ahead, breathing heavily, completely in the zone. Then, I slowly started to pull ahead. I spent the next few minutes terrified that she was going to chase me down, so I just kept chipping away, doing my best to maintain my form. I was in a total altered state of consciousness, focused in the moment and completely connected to my body’s every move. I could feel that I was pushing harder than I ever have before, and I was determined to leave every ounce of energy out on the course. Just as quickly as it began, I was rounding the final corner into the finish chute. As I stepped onto the blue carpet, the final stretch before the finish line, I saw my friends from Team USA cheering me on from the grandstand. Then I heard the announcer say my name, followed by four magic words, “she’s in the clear.” It was like being punched in the stomach, but in the best possible away. I felt a rush come over my entire body that almost forced me to a stop. But I continued moving forward, slowly to take it all in, and looked up at the finish clock with tears in my eyes. After many months of envisioning this moment, I had actually done it. After all the early mornings when I didn’t want to get out of bed, all the times that I proclaimed that I hated triathlon, and all the workouts that left me feeling like I’d never measure up, there I was, watching my dream finally come to fruition. And in that moment, the pain, the sacrifices, the doubt—it was all worth it. That moment on the carpet was nothing short of magic. And it proved to me that moments like these were worth fighting for. As soon as I stepped across the finish line, I took a few seconds to catch my breath before entering a sea of hugs. The official verdict on Denmark had not yet been delivered, but I think we all knew what it would say. I was being congratulated by my teammates as the new World Champion, a title that didn’t sink in until many days later. Melissa crossed the finish line shortly after me, followed by Sarah minutes later. After taking our moments, Melissa came over, gave me a hug, and told me she was proud of me. The genuineness of her words reaffirmed what I already knew about our relationship: we are both undyingly competitive, and when we toe the line we are opponents—but at the end of the day, we are friends first and that will never change. Melissa is without a doubt the classiest person I know. Whether she wins or loses, she does so with respect, humility, and grace. 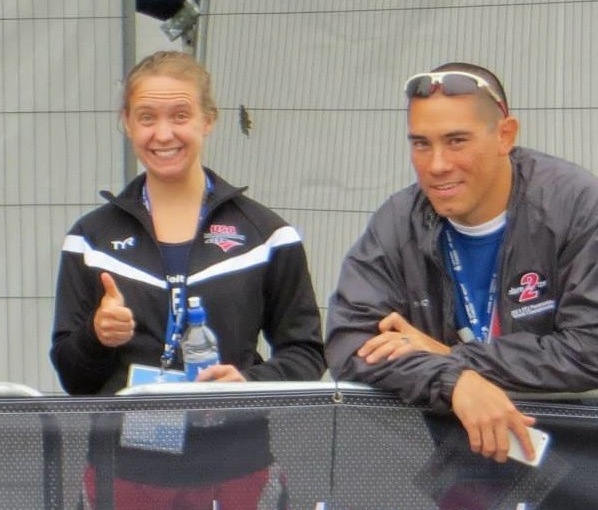 Melissa has mentored me through many of the logistical aspects of triathlon, but without even knowing it, she has also taught me about character. As I strive to carry myself in a way similar to this incredible athlete, I feel truly lucky to have learned from the best. 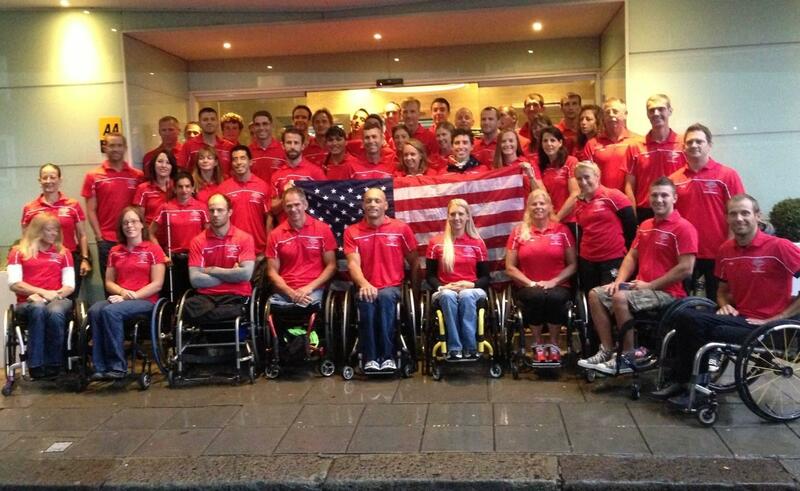 That night, Team USA went out to celebrate the 12 medals we were bringing home. We dined on fish and chips, toasted pints of beer, and danced the night away. It was so much fun bonding with my teammates and showing our true colors in post-race mode. Even though we only see each other two or three times a year, we’ve become like one big, semi-functional, traveling family. While traveling to races is fun on its own, these guys are what make it truly special. It is a real honor to walk amongst a group of so many great people. Reflecting on how the race went leaves me with many emotions. As a friend, I am sad that Melissa’s race did not go the way she wanted it to. And as a competitor, I wish it would have been a clean race. None of us will ever know what the result would have been if that flat hadn’t happened. All we can really do is keep working hard, and look forward to the next time we compete. But regardless of flat tires and misclassifications, I had a wicked race. I was 100% in the zone the entire time, and it was really the first race that I left it all on the course. My run split was faster than I knew I was capable of, beating my previous 5K record by 90 seconds. I trained hard, put in the work, and in the end, I had a great day. And while I feel for the fact that some races did not go as planned, I can’t let that take away from the fact that I am truly proud of my race. I was proud for a lot of reasons. For so long, I felt like I was living in the shadows. I could train all I wanted, but I would never be the best. It may have been coming from my own insecurities, but I often felt like I was viewed as the incessantly energetic, naïve rookie—the one who was okay, but would never be taken too seriously. This race proved to those who watched (but most importantly, to myself) that this wasn’t true. It proved that I’m more than just the 22-year old kid who smiles too much and always talks about ice cream. I’m a competitor in my own right, and I’m there to win just like everyone else. 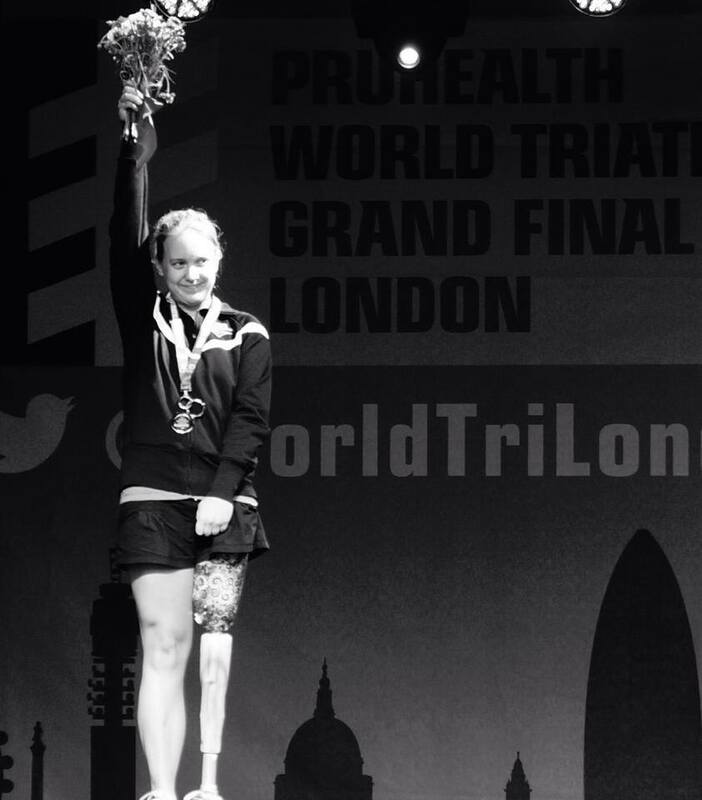 I think that was one of the sweetest parts of winning London—I had finally proven that I was worthy of being there. I believe that the results in London will open a whole new door for the TRI-2 women of the world. As we enter the 2014 season with two years to go until Rio, we will all continue to push each other to be faster and stronger. The results of our races will no longer be predetermined, and we will have to bring our A-game at each and every race. It’s good for the sport, it’s good for our category, and it’s good for each of us. And I couldn’t be more excited. So there you have it. London 2013 in a post that ended up being way longer than I intended. But before I end it, I have to extend a huge thank you to everyone who has stood by me and my dream over the last three years. 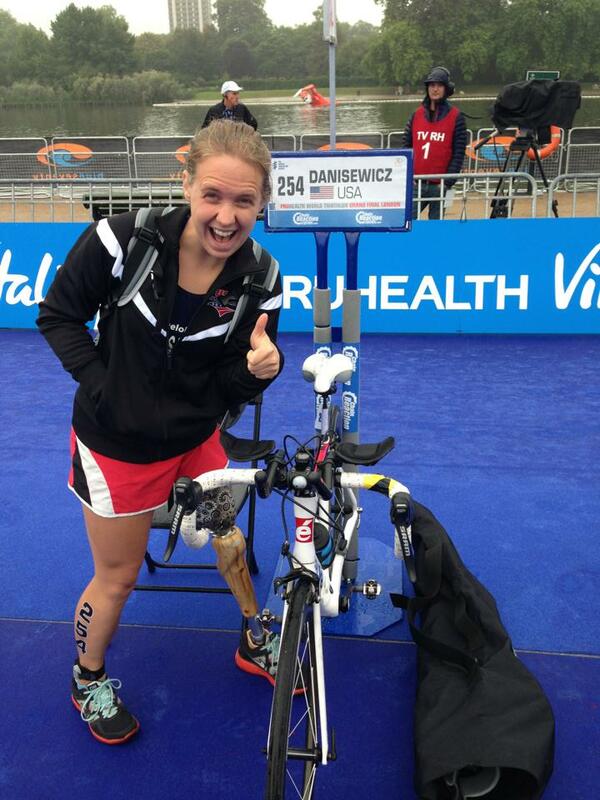 First and foremost, thanks to dare2tri for introducing me to this crazy sport, and for being by my side from my first race in Chicago to my first gold medal in London. I also must acknowledge all my family and friends who once again amazed me with their willingness to help me raise the funds to travel and compete. None of this would be possible without their generosity. I’ve spent much of the last month overwhelmed by the love I’ve received from friends through their well wishes and words of support. Please know that each of you have made this experience all the more fulfilling. I’m a lucky lady indeed.